The ones in bold are in the 100 Best Scottish Books list. I’ve read 33 Scottish (in the broadest sense) books in 2018, 7 SF or Fantasy (italicised,) 13 by women, 20 by men. E M Brown (aka Eric Brown) qualifies by having a small part of Buying Time set in Scotland and by living near Dunbar for the past few years. I’ve not a good balance this year between men and women, mainly due to exhausting the women on the 100 Best list. Serious Sweet focuses on the activities of London dwelling Jon Sigurdson, a civil servant who has come to hate his work, and Meg Williams, bankrupt accountant and recovering alcoholic, over the course of one day in which they do not come together till late on. The book tends to follow each in turn with their actions and encounters in normal text and their inner thoughts rendered in italics. Smaller snippets, snapshots of daily life in London, intersperse the time denoted incidents of their day. It all makes for a rather dense reading experience. Jon is divorced after his wife had a series of affairs but loves his daughter Rebecca. Meg has just had an all-clear appointment at the gynaecologist, after treatment for cancer of the womb, which has nevertheless left her sad at the loss of the possibility of having children. Jon had previously had a wheeze of inviting women, via an advertisement, to pay him to write them letters expressing kind thoughts. They may write back to him but the idea is that they never meet. (It is hinted that on Jon’s part this may be an elaborate cover to reveal government secrets in letters to someone called Lucy though this is not fully explored.) Meg took up his offer and they met when she tracked him to the PO Box where he picks his letters up. But they do not have a formal relationship. A series of everyday obstacles – and a crisis meeting – prevent their planned dinner date but they do eventually get together late in the day. Through Jon, Kennedy provides a commentary on the indifference – almost savagery – of the prevailing attitudes of those in power, “Suffering no longer indicates hardship, it indicates bad character and celestial punishment. And if God has seen fit to punish – well that invites further loss,” is followed by, “Tell the average mug punter to put ten quid in the communal tin, wake him up the following morning and he’ll accept without hesitation that asking for ten pence back because he needs it would be a sin.” The mantra is “Opinions Not Facts. These are our watchwords.” Its effect is that people are forced to fail and then they are blamed for that failure. The strategy is to, “Advise them badly, advise them misleadingly and issue threats.” Which only compounds their – and society’s – problems. The reply he gets is that, “‘Conservatives know you can’t change human nature and therefore the suffering … have brought their pain upon themselves. They could only be forgiven if they thrived …. and no longer need any help. And if you can’t change human nature, you don’t need government …. except for those posts occupied by those who believe you can’t change human nature. That this is embedded in a narrative which tends to meander takes off its edge somewhat. The book is not one that rewards light reading. Persevere though and it has its moments. The Fascaray Archives, Harvill Secker, 2017, 585 p.
Blessed – and blighted – by the success of his song Hame tae Fascaray in the early 1960s (the list given of artists who have recorded it includes among the great, the good – and the unlikely [The Three Tenors? Dolly Parton?] – the wonderfully named Shooglenifty) and whose lyric bears some (undoubtedly intentional) similarities to The Mingulay Boat Song, McWatt is stand-offish – except perhaps in his cups – curmudgeonly, opinionated, a staunch supporter of both the Scots language and the islanders’ interests, fiercely anti-landlord and even more virulently anti-English – almost a caricature, although solidly fleshed out, of the dour Scot. His relationship with Lilias Hogg (the Flooer o Rose Street) – represented here as something of a poet’s groupie but evidently devoted to McWatt – is predictably distant, not helped by Hogg’s discovery of letters to McWatt from a mysterious woman named Jean. Though it is twice (subtly) foreshadowed I’m still undecided as to whether the twist in the final sections revealing the nature of Jean’s relationship to McWatt enhances or detracts from McAfee’s overall tale; either response is legitimate. No matter: notwithstanding the embedded tales with which McAfee has provided us here, what is impressive is the journey, the relish in the use of Scots, the demonstration of its vitality, its refusal to lie down and go away. 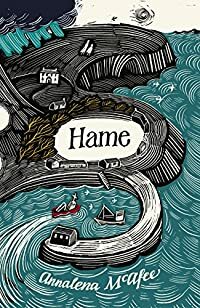 Hame is a book which revels in the ongoing Scottish tradition in literature. 2piece is of course a Scots word for sandwich. In a programme on BBC 1 Scotland last night the results of a poll to discover Scotland’s favourite book were announced. These were apparently voted on from a long list of thirty books. As usual the titles marked in bold I have read; italics are on my tbr pile.The ones marked by a strike-through I may get round to sometime. Thanks to my working through of the 100 best Scottish Books and the Herald’s “100” best Scottish Fiction Books I have read nineteen of these, with two on the tbr and others maybe to consider. I suspect that in the fullness of time some of the more modern of them will fall away from public affection. I am particularly pleased that James Hogg’s The Private Memoirs and Confessions of a Justified Sinner made it here and the strong showing of Alasdair Gray was also welcome. Personally I don’t think The Wasp Factory is Iain Banks’s best book but only one from each author was on the long list. Gibbon’s Sunset Song was the one I predicted to the good lady would come first. Since its publication it has been an enduring favourite with Scottish readers. I came across this list a week or so ago. There are some odd choices in it. The Woolf and Orwell are surely pushing it a bit to qualify as in any way Scottish. And The King James Bible? Yes he was primarily a Scottish King but the endeavour was undertaken for reasons to do with his English realm. Those in bold, I have read. There’s a lot I haven’t. Time to pull my socks up. (Edited to add:- Those with a *I have now read. John Galt – Annals of the Parish* (1821) I’ve read The Member and The Radical. See my review here. Aonghas Pàdraig Caimbeul – An Oidhche Mus Do Sheòl Sinn (2003) This is written in Gaelic and hence beyond my competence. Kate Atkinson – Behind the Scenes at the Museum – (1995) I read this years ago. Ian Rankin – Black and Blue* (1997) I’ve not read this Rankin but I have Knots and Crosses. Matthew Fitt – But n Ben A-Go-Go (2000) Science Fiction in Scots! Brilliant stuff. AJ Cronin -The Citadel (1937) Cronin was from Dumbarton. I’ll need to read him sometime. R. M. Ballantyne – The Coral Island (1858) I may have read this as a child but I cannot actually remember doing so. James Kelman – A Disaffection (1989) I read years ago. Kelman is essential. William McIlvanney – Docherty (1975) Again read years ago. Again McIlvanney is essential reading. David Hume – An Enquiry Concerning Human Understanding (1748) Philosophy. I haven’t read this. Andrew Greig – Electric Brae (1997) A superb first novel. See my review here. Tobias Smollett – The Expedition of Humphry Clinker* (1771) Smollet was from Renton, which is 2 miles from Dumbarton. Agnes Owens – For the Love of Willie (1998) See my review here. Ian Fleming – From Russia, With Love (1957) Fleming? Scottish? Only by extraction it seems. Alistair MacLean – The Guns of Navarone (1957) I read this many years ago. Decent enough wartime thriller. Joseph Conrad – Heart of Darkness (1902) Conrad was the favourite author of the original Jack Deighton (my grandfather.) I’ve read The Secret Agent and always mean to get round to more. But… Wasn’t Conrad Polish? Ali Smith – Hotel World (2001) See my review here. George Douglas Brown – The House with the Green Shutters (1901) A Scottish classic; see my review. Chaim Bermant – Jericho Sleep Alone (1964) is on the tbr pile. James Robertson – Joseph Knight (2003) Robertson is another of those very good present day Scottish authors. My review of Joseph Knight. Various – King James Bible: Authorised Version (1611) ???? See comments above. Alasdair Gray – Lanark (1981) Absolutely superb stuff. More essential reading. Bella Bathurst – The Lighthouse Stevensons* (1999) Non-fiction. I bought this for the good lady and it’s another I keep meaning to read. George MacDonald – Lilith (1895) The Scottish tradition is to write fantasy rather than SF. I’ll need to catch up with this. Alan Spence – The Magic Flute (1990) I’ve read his Way to Go. Alan Warner – Morvern Callar (1995) I think Warner’s most recent books The Worms can Carry me to Heaven and The Deadman’s Pedal are more successful. George Orwell – Nineteen Eighty-Four (1949) I know it was written on Jura but Orwell? Scottish? Christopher Brookmyre – One Fine Day in the Middle of the Night 1999) Brookmyre is a fun read – if a little too liberal with the violence. But this isn’t even his best book. See my review here. Andrew O’Hagan – Our Fathers (1999) I have yet to warm to O’Hagan. My review of this book. A.L. 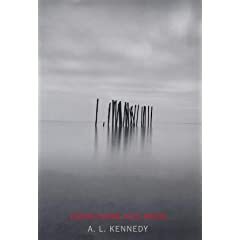 Kennedy – Paradise (2004) Kennedy’s more recent Day and The Blue Book impressed me more. Muriel Spark – The Prime of Miss Jean Brodie (1961) My review is here. James Hogg – The Private Memoirs and Confessions of a Justified Sinner (1824) The quintessential Scots novel. The döppelganger tradition starts here. Walter Scott – Rob Roy* (1818) Scott more or less invented the Scots historical novel but I can only remember reading Ivanhoe. Thomas Carlyle – Sartor Resartus (1836) Anothe disgraceful omission on my part I fear. Neil M Gunn – The Silver Darlings* (1941) Of Gunn’s work I recently read The Well at the World’s End. Ron Butlin – The Sound of My Voice (1987) I’ve not read his poetry but Butlin’s fiction is excellent. My review of The Sound of my Voice. Robert Louis Stevenson – The Strange Case of Dr Jekyll and Mr Hyde* (1886) Following on the döppelganger tradition from Hogg. Again I can’t remember if I’ve read it or just watched adapatations on TV. Lewis Grassic Gibbon – Sunset Song (1932) A brilliant novel. Worth its status as a classic. See my thoughts here. Janice Galloway – The Trick is to Keep Breathing (1989) I fear Galloway is an acquired taste. See here. Jackie Kay – Trumpet (1998) I read this last year. David Lindsay – A Voyage to Arcturus (1920) In the Scots tradition of the fantastical but has a weirdness all its own. Iain Banks – The Wasp Factory (1984) The much lauded Banks debut. I’ve come to think A Song of Stone may outrank it. Adam Smith – The Wealth of Nations (1776) The foundation stone of Economics. Jessie Kesson – The White Bird Passes (1958) To be reviewed within the week! Kenneth Grahame – The Wind in the Willows (1908) I may have read this as a child but can’t honestly remember. Jonathan Cape, 2011, 375 p.
Sumptuously produced with embossed boards, gold leafing, patterned endpapers and page edges in a blue so deep it’s almost purple this is a consciously literary endeavour. It makes frequent reference to your book, the book you are reading, and also has unconventional upper pagination (the numbers at the bottom of the page are in the normal sequence.) It also explicitly mentions the fact that it has three pages numbered 7 – with a page 18 well out of sequence. In addition The Blue Book has three pages numbered 9, two 8s,10s and 27s as well as 0s and 1s towards the end; not forgetting a 666, a 676, a 678, a 798, an 888, a 919 and a 934 in a book with only 375 pages. (There may be some of these I have missed.) Numbers are an important means of communication for the two main characters and Kennedy has toyed with this notion and with us. Quite how necessary it is to do so is another matter. A further notable feature was the repetition of phrases, “Because he was young,” “A man standing in a doorway,” etc. The narration is not straightforward, sometimes describing aspects of a man’s life in detached third person, at others the internal thoughts of Elisabeth Barber as well as the ongoing narrative. There is also a rather high count of a certain expletive. One of the scenes tells us of a boy being told about girls by his father. Girls, he says, will not be gorgeous like Dusty Springfield, whom the boy rather likes. Or if they are this will not be good news. Which seems like sound advice. The meat of the novel is compressed into the time scale of a cruise across the Atlantic to New York but there are various flashbacks to earlier incidents in the two main characters’ lives. Elisabeth is taking the trip with her boyfriend Derek who is on the brink of proposing. In the queue to embark they encounter a man who engages them in conversation. This man’s question to Elisabeth later that day when Derek is absent seems shocking but it turns out Elisabeth used to be his partner, not only in life but also on stage in a show which was basically a con where he claimed to have messages from the dead to their loved ones in the audience. The disintegration of Elisabeth’s relationship with Derek and her renewal of that with Arthur Lockwood – implicit from that encounter in the queue – drives the novel. A flaw for me though was the fact that The Blue Book depends for its emotional impact largely on the late revelation of a crucial piece of information up till then withheld. To be fair it is withheld from one of our duo of characters but it felt too much like a deus ex machina. The Blue Book is not one to be read lightly, nor with lack of attention. The back cover blurb of What Becomes makes explicit reference to the old Jimmy Ruffin (among many other performers) hit What Becomes of the Brokenhearted and this collection of short stories does mainly examine fractured or doomed relationships within or outwith marriage. The emblematic story title here would be Whole Family With Young Children Devastated though in the story concerned it actually refers to a notice about a lost pet displayed on local lamp-posts. Two stories are exceptions. Another concerns the careful reconstruction of a new life and relationship after the woman’s husband has died, while As God Made Us is about the camaraderie of a group of ex-soldier amputees and the prejudice they still face. Kennedy’s style in her short stories is oblique. Very little is stated outright either by her narrators or by the characters but it is all exquisitely, carefully written. The overall sense is of people clinging on, desperate to make connections. There was one peculiar phrase where a character was described as, “constructing these laborious smiles which I think were designed to imply he was a dandy youngster and blade about town,” – of which I can only make sense by assuming that similes was the intended word. But if it’s not in fact a typo it’s brilliant. Day follows the fortunes of Alfred Day, a former tail gunner in a Lancaster bomber during World War 2. This might lead you to believe he will die in the novel’s denouement – rear gunners were notably short lived, being the first target a night fighter might hit in an attack run and unsuitably positioned to exit a doomed Lanc easily should the worst happen – but it is quickly revealed that after the war he returns to Germany to take a part in a film set in a POW camp. The book roams back and forth through Day’s wartime life, the filming and his relationships with the bomber’s crew, his parents, and the married woman he takes up with. The prose shifts in various ways. The narrative is not linear, the point of view changes, as do tenses and even the person in which the novel is related. Passages related by “you” – ie in the second person rather than the more familiar first person, I, or third person, s/he, are notoriously difficult to bring off – but Kennedy slides into them and out again with facility. The post war scenes are the least engaging. They seem to be present to allow Day to recollect his wartime experiences from some distance though they do reveal part of his character and the ugly compromises made by the war’s winners as their old allies turned into adversaries and vice versa. The front cover tells us Day won the Costa Book of the Year 2007. While the fractured nature of the narrative may render it difficult to read for some, the gradual unravelling of the story does build to its conclusion; where there are no unsignalled authorial surprises waiting for us. Everything You Need by A L Kennedy. This blog is supposed to be about writing, fiction, football and whatever; yet so far I’ve posted nothing about writing. Here’s the corrective. I don’t know whether I ought to or not but I intend to post reviews of the books I have read recently. This is the first. Kennedy comes laden with praise and plaudits but I’ve always found it difficult to find a way into her work. There can be an opacity about her prose that obscures understanding (or is that just me?) Everything You Need has this opacity at the start but does become more transparent once the story gets into its stride. It’s mainly set in Wales on an island retreat where a group of writers support one another in their literary efforts. As such it breaks one of the little spoken rules of writing – don’t write about writers – but, of course, as one of the characters says near the end, there are no rules. There are also occasional forays to a London publisher’s or to literary parties. In terms of characterisation the homosexual relationship between the two “uncles” is handled matter-of-factly and without tripping into sentimentality later on where it might have, though strangely – the book is set in the 1990s – the treatment of Mary’s relationship with her boyfriend Johnno felt a little old-fashioned. There was a touch of the 1950s about it. The novel also had echoes of The Wasp Factory – even before the obvious incident late in the book where this comparison is most apt. Since it is over 500 pages long (though the type face is large) and my reading time is short, I had put off reading this novel for years. However, it does not feel like time misspent. The characters were well drawn and mostly engaging, though Nathan’s dithering was a touch annoying. But without that there would have been neither plot nor tension so I’ll have to forgive Kennedy there. Everything You Need contains nothing particularly startling or revelatory about the human condition beyond displaying how difficult communication can be between people – especially if they care for each other – but there are worse ways to while your hours away.